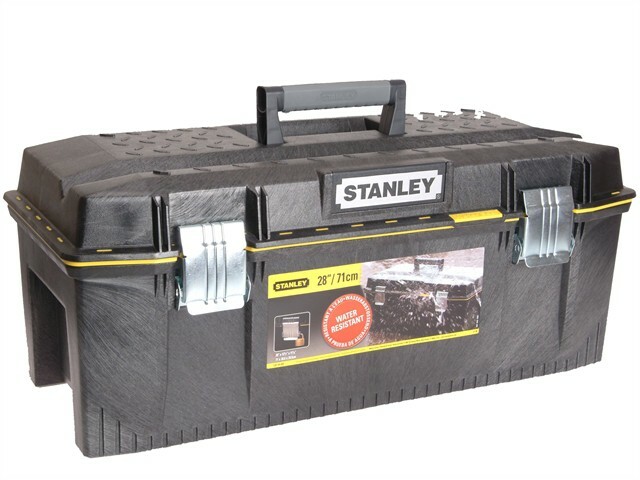 The Stanley FatMax® Waterproof Toolbox with all round water seal, IP53 rated, to ensure safe and dry storage. Constructed of structural foam for extra strength and has extra large storage capacity. The portable tote tray is designed to carry tools and small parts, yet enables large tool storage inside the toolbox as it is 3/4 length. An integrated V-groove on top of the lid enables sawing when needed, and is also suitable for working with pipes and timber. The tough ergonomic soft grip handle allows heavy loads to be carried with ease. Large metal rustproof latches for secure closing.